Did the Modi government really build 1.53 crore houses for the urban and rural poor under the Pradhan Mantri Awas Yojana? India’s interim finance minister Piyush Goyal stated the same while presenting the interim Union Budget 2019 on 1 February. b) Modi government could build 1.25 crore houses in their almost five year tenure till January 19, 2019 — as claimed by the Prime Minister himself, less than two weeks before the budget. So, let’s do a fact check. Of course, rural housing programmes are not new. It started right after Independence to provide shelter to the refugees who came to India after Partition. Various schemes were tried and some even implemented by both the central and the various state governments over a period of time in response to pressures from the social formations and mass movements. Till the mid-80s, there was no uniform policy for rural housing in the states. Back then some states used the National Rural Employment Programme (NREP) and the Rural Landless Employment Guarantee Programme (RLEGP) to partly fund the houses’ construction, which would ask of the beneficiaries that they bear part of the construction cost. Some states funded the entire construction using the NREP/RLEGP funds. Some states allowed only new construction with these funds, but others allowed renovation of existing houses which were apparently in dilapidated conditions. In June 1985, the then Congress government launched the Indira Awas Yojana (IAY) to construct houses for the Scheduled Caste and Scheduled Tribe communities as well as for freed bonded labourers. IAY was a sub-scheme under RLEGP with the funds for it being earmarked from RLEGP as well. In April 1989, when the Jawahar Rozgar Yojana (JRY) was launched, IAY became a part of it. Six per cent of the JRY budget was earmarked for IAY. Old Planning Commission documents reveal a total of Rs. 1,139.75 crore were spent between the launch of IAY in 1985 and 1992 for construction of slightly more than ten lakh houses. The beneficiary of the scheme had to be a female member of the household. It could also be allotted on the joint name of husband and wife. When it is proved that there is no eligible female member in the family, only then could it be allotted in the name of a male member. The scope of the scheme was later extended to cover ex-servicemen, families of the personnel from defence services/paramilitary forces killed in action, displaced persons and special tribal groups. From financial year 1993-94 onwards, the IAY budget was increased from six per cent of the total JRY kitty to ten per cent and the cover extended to included non-SC/ST Below Poverty Line (BPL) families. On January 1, 1996, IAY was delinked from JRY and made an independent programme. The 2006-07 Annual Report of the Ministry of Rural Development provides the comprehensive year-wise numbers of the houses constructed under IAY. Since its inception up until 2003-04, a total of 1,15,05,109 houses had been constructed. Up to February 21, 2007, the total number of houses reached 1,53,94,375. In 2005, the then-government launched the Bharat Nirman Programme (BNP) in two phases, aimed at accelerating the development of rural India. Government programmes like roads, electricity, telephone connections, irrigation, housing for the poor and drinking water were brought under one umbrella. The Planning Commission Annual Report of 2013-14 shows that in the first phase of Bharat Nirman, from 2005-06 to 2008-09, against the target of 60 lakh houses, a total of 71.76 lakh houses had been built. In the second phase, from 2010-11 to 2013-14, against a target for 120 lakh houses, 118.5 lakh houses were constructed till March 2014. In 2004-05, the ministry annual report shows 15,21,305 houses were constructed. This shows that the two UPA governments, in their tenure of ten years, constructed a total of 2,05,47,000 houses. The first annual report of the ministry under Modi government (2014-15) says the total number of houses constructed under IAY since inception are 3,33,82,000 with a total expense of Rs 1,17,039 crore. Interestingly, the Ministry of Rural Development does not have its annual report of 2013-14 uploaded on their website even after five years. But a hard copy of the same can be ordered on an e-commerce portal for Rs 500! So in order to verify the numbers of 2013-14 and 2014-15, the best possible and somewhat reliable option is the report of the standing committee on rural development (2015-16). This graph will explain the year-wise number of rural houses constructed under the central government sponsored schemes since 2004-05. A simple calculation shows that from 2009 to 2014, a total of 1,23,00,000 houses were constructed under IAY. In the previous five years from 2009, the number stands at 86,97,000. 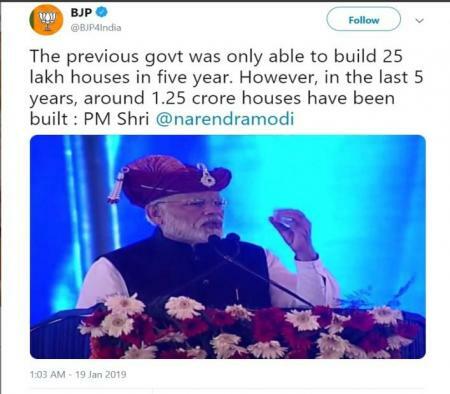 So, what could have prompted PM Modi and his partymen to say only 25 lakh houses had been constructed in the five years before he came to power? On January 19 this year, the PM said his government had built “around 1.25 crore houses” in five years, followed by the interim budget speech on February 1, when Piyush Goyal claimed in Parliament that the Modi government had constructed 1.5 crore houses in its tenure. Compared to the past, this claim does not amount to an outstanding achievement. But first to the veracity of the claim. 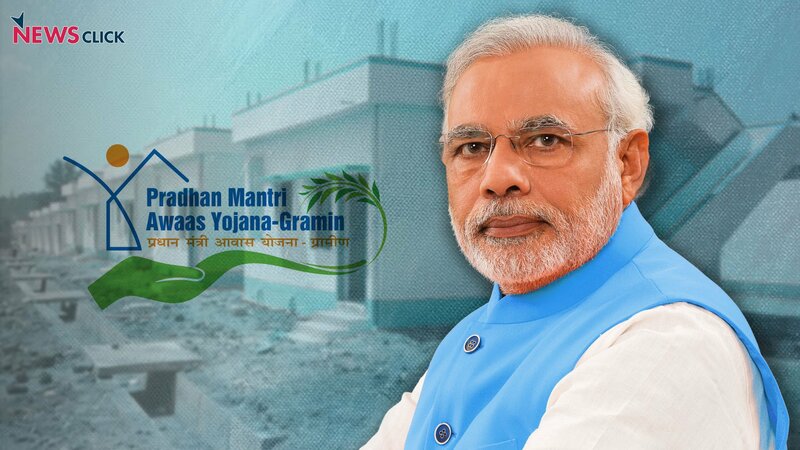 PM Narendra Modi launched the Pradhan Mantri Awas Yojana (PMAY) on November 20, 2016—with a stated vision of ‘housing for all’ by 2022. The target set then was 2.98 crore houses. Without any other major changes in the scheme, the amount released per house increased from Rs 70,000 to Rs 1,25,000 under PMAY. The scheme has two components—PMAY (G) for rural and PMAY (U) for urban. When IAY dealt with rural housing, the Rajiv Gandhi Awaas Yojana was for the urban poor. Here, we are looking only at the numbers of rural schemes. PMAY website says 1,12,41,824 people registered since the inception of the scheme in 2016. Of those who applied, a total of 95,35,421 people got sanction and 68,53,000 houses were constructed. Since the website shows data only from 2016-17, adding the numbers from 2014-15 and 2015-16 gives us a total of 1,03,27,000 houses. These numbers are up to February 2, 2019, but can still be counted as numbers for five years because the numbers from April 2014 and May 2014 are included. 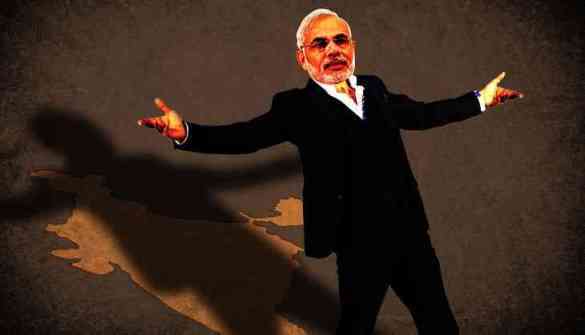 Also Read: PMAY – Another Monument to Modi’s Failed Policies? In absolute numbers, this amounts to nearly 21 lakh houses less than what the previous government did in its five-year term. In other words, the UPA-II constructed 20 per cent more houses than the Modi government in five years. This number of 1.03 crore houses, if we analyse the year-wise break-up, throws up some interesting statistics. The previously mentioned Standing Committee report points out there are long delays in completing the construction of houses after the sanction. Year-wise number of houses completed under IAY during the tenure of Modi government shows 24,28,848 houses sanctioned in 2013-14, while for nearly eight-and-half lakh houses, construction spilled over to 2014-15. The CAG report on IAY cited that in many states like Gujarat and Jharkhand, in violation of the IAY rules, completion of houses was taking more than 2 years and that spill over was being counted only in the year of completion. Meanwhile, a PIB release dated August 1, 2018, contradicts what the government claims in their dashboard. In this, the Ministry of Rural Development says, in 2014-15 only 11.93 lakh houses were constructed—5 lakh houses less than what they claimed on their website and submitted to the Parliamentary Standing Committee. And we must remember the spill over of nearly 8.5 lakh houses, which were sanctioned, but not completed in the previous year. In effect, this means that whatever may be the sanctioned number, approximately 3.5 lakh new houses were constructed that year. The next discrepancy is observed in the numbers for the year 2017-18. 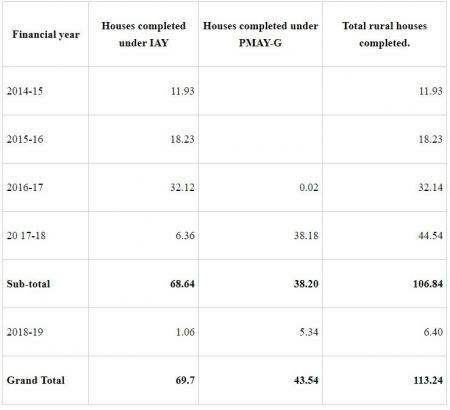 The ministry’s press release shows that 38.18 lakh houses were completed under PMAY-G, and that 6.36 lakh houses were the carry-forwards from IAY. This takes the total up to 44.54 lakh completed houses in that year, and it is not matching with what the government says on the dashboard, which is said to be more accurate because the data is supposed to be uploaded and updated on a daily basis. Let us assume all sanctions were done under the new name of PMAY since December 2016 after renaming of the programme in November. Still, the numbers in the ministry’s press release say 38.18 lakh houses were completed under PMAY that year. Meanwhile, the programme dashboard that is updated on a daily basis shows only 34,07,771 people registered in 2017-18 even as 29,32,510 houses were sanctioned that year. The total houses completed were 21,32,810—less than half of what the Modi government claimed in its press release. As per the press release, 1.132 crore houses were built till August 1, 2018, since April 2014. At the same time, the daily updated dashboard displays an entirely different picture. It doesn’t end here. Dashboard shows the target set by the government is 99,95,825 and 1,12,41,843 people registered. The government sanctioned only 95,35,421 houses as on February 2, 2019. But our Prime Minister claimed on January 19 that under his rule, 1.25 crore new houses had been constructed. Piyush Goyal went a few steps ahead of the PM to claim that 1.53 crore houses had been built under the PMAY—when even the total applicants are not more than 1.12 crore. Even adding the PMAY urban numbers of nearly 13 lakh houses in 5 years, we do not reach that figure. It is important to note that these numbers include all state-sponsored schemes, unlike the IAY numbers. Many states give much higher financial support to the beneficiaries on top of the Rs 90,000 support from central government. States like Telangana and Kerala have reportedly opted out of the scheme, especially as the Modi government was usurping credit for the efforts of the state governments. For example, Kerala provides Rs 4 lakh per house under their scheme now, while the Centre provides only Rs 90,000 per unit as per their guidelines. Telangana was in fact the first state to opt out. In a nutshell, both PM Modi and interim FM Piyush Goyal were lying about the number of houses built. As usual, the Modi government was manipulating data to create hype regarding their non-existent achievements.